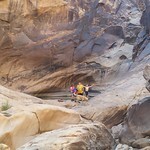 Eardly Pool is yet another great hike in the San Rafael Swell. My brother in law told me about this hike after he took a group of scouts there and it turned out to be just perfect for a short afternoon hike after our Behind The Reef ride in the morning. 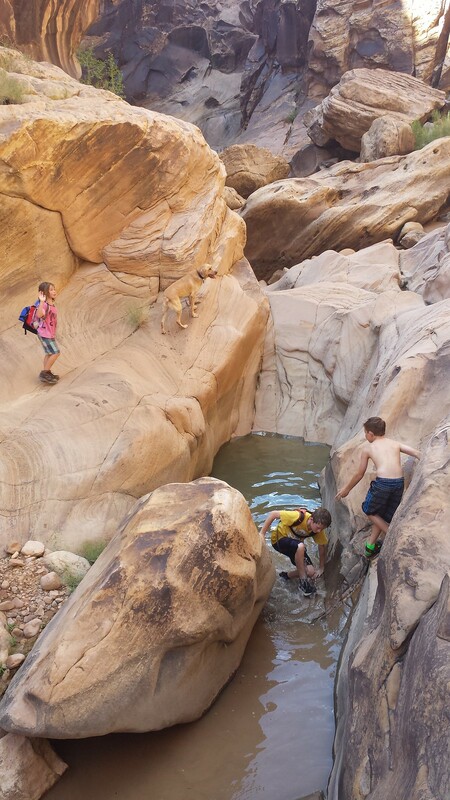 The complete Eardly Canyon hike requires repelling equipment to complete and will treat you to more pools and a longer hike, but the largest of these pools can be reached very easily only requiring a fun short hike. We decided to do the hike on a rather warm day in the hottest part of the day because we knew we'd be taking a swim once we arrived at the pool and we know how cold these pools can be. As I said, this a fairly short hike. There is a shortcut that we took as shown on the map below. We have not done the other portion so I'm not sure if adding this back into the hike would be worth it, but it definitely looked like it could be a scenic addition. Our goal was to make it to the pool as quickly as possible and cool off. 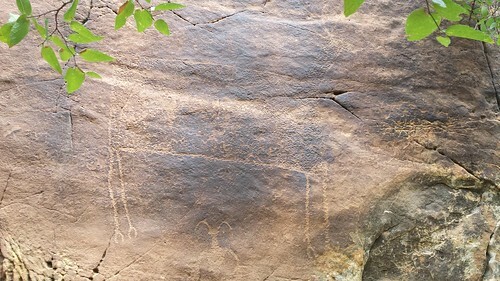 Just as you begin the hike there are some Indian petroglyphs that are definitely worth the stop. They can be hard to find because they are hidden by the trees. Time To Complete: 3 to 4 hours depending on how long you linger in the pools etc. The dirt road leading to the parking area is best traveled with a high clearance vehicle. The road is not terrible, but there are a few spots that require careful driving. 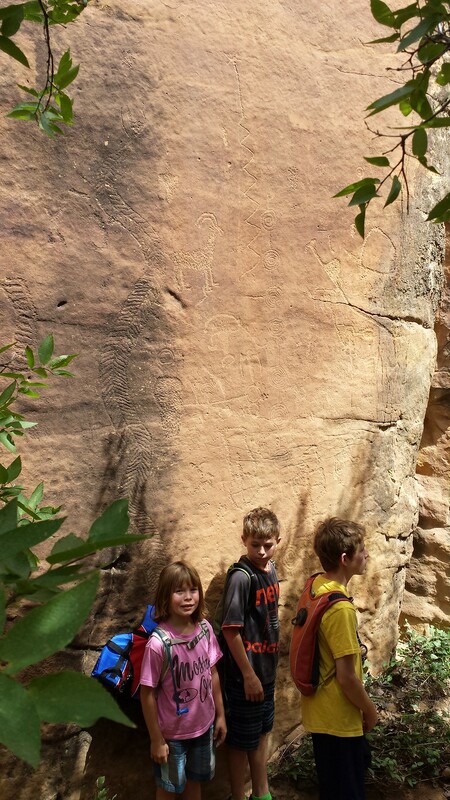 The hike is easy with most of it being in the main wash within the canyon. 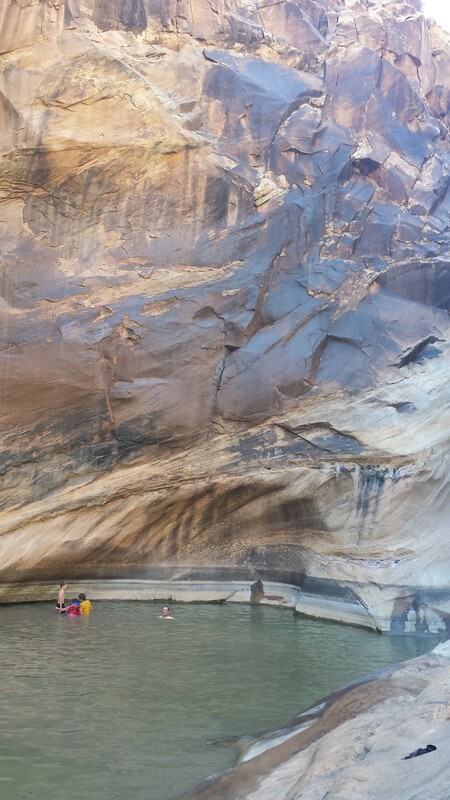 The canyon to Eardley Pool is very tight and requires bouldering skills. You can stay dry if you skirt around the pools. This narrow section is very short before getting to the pool. We enjoyed the entire hike, but this more technical part was the most fun for us.